Everyone knows that the Lexus brand represents high-end posh, power, and panache, and the Japanese automaker’s flagship 2015 Lexus LS 460 once again offers a case in point. This 5-passenger full-size luxury sedan comes with a new trim for 2015, as well as a few tweaks to its already impressive list of tech. Unfortunately, Toyota’s luxury brand lacks cachet when compared to such over-the-top European manufacturers as Mercedes-Benz and BMW, as well as Volkswagen-owned Porsche and Audi. Nevertheless, the 2015 LS 460 lineup, now offered with a brand new top-shelf Crafted Line trim joining the returning Base and L variations, sports a hefty dose of value-laden luxury. In addition to the debuting Crafted Line iteration for this latest model year, Lexus has upgraded all its LS 460 trims by adding new software to the standard navigation feature tacking on new standard Enform Remote Smartphone apps and Slacker internet radio. A further upgrade for 2015 includes gridlines added to the standard rear-view camera display. Finally, the now-flagship Crafted Line trim (inspired by the athletically gifted F Sport package) comes with unique exterior paint and a complementary set of Tumi luggage to spice up its already impressive plush and performance factors. Of course, Lexus delivers all 2015 LS 460 trims with standard rear-wheel drive (RWD), but drivers facing a wintry commute can get any of the 3 trims with available intelligent all-wheel drive (iAWD). Meanwhile, the 2015 LS 460 L offers almost 4 inches of added wheelbase length over its regular-length siblings (121.7 inches versus 116.9), resulting in an overall length of 205 inches. These extra inches add up to a ton of extra legroom in back, one of those touches the modern executive has grown to appreciate. Power-wise, look for the return of the standard 4.6-liter V8 engine and its accompanying 8-speed shiftable automatic transmission in all 2015 LS 460 iterations. This capable V8 puts out 386 hp and 367 lb-ft of torque in RWD-equipped versions, while AWD variants, curiously, drop output to 360 hp and 347 lb-ft of torque. Mileage estimates run 16 mpg city/24 highway in RWD trims and 16/23 in AWD variations. Additionally, each LS 460 comes equipped with 4 driver-selectable cruise modes (Normal, Sport, Snow and Eco) that adjust throttle response and shift points to reflect surface conditions of the moment. Be advised its underwhelming 6.1-second 0-60 time dogs this otherwise capable powertrain, reflecting a decided inferiority to turbocharged offerings from European luxury performance sedans. On the other hand, the LS 460 equals or surpasses many of its Germanic challengers in pure posh. Depending on the trim selected, the 2015 LS 460 offers 18- or 19-inch alloy wheels, a power sunroof, heated power-folding and power-adjustable mirrors, and power-closing doors adorning its sleek profile. Inside, such goodies as leather upholstery, power-adjustable front seats, full power accessories, cruise control, and power-adjustable telescoping tilt-wheel steering give this elegant sedan its justifiably praised cabin ambiance. Additional creature comforts aboard all trims include a rear-view camera (now with those new-for-2015 grid lines), memory for driver’s settings, dual-zone auto climate control (Base), and the already-mentioned upgrades to the Bluetooth-interfaced Enform infotainment system with its 12.3–inch touchscreen display. Entertainment features in the Base LS 460 and its L counterpart include a single CD/MP3 player with 10 speakers, high-definition satellite radio, iTunes tagging, and auxiliary audio input. The 2015 LS 460 L, by the way, adds heated and ventilated front seats, a heated steering wheel, and a power-closing trunk onto those standard features found in its lesser Base sibling. Moving up to the new Crafted Line trim, look for such additional bells and whistles as upgraded brakes, a limited-slip rear differential (RWD only), a sport-tuned air suspension, variable-ratio steering, upgraded shift points, and a Mark Levinson premium audio upgrade boasting 19 Surround Sound speakers. Many of the above extras can, of course, be had in lower trims via the available F Sport Package. Packaged options include 4-zone auto climate control and power-adjustable rear seats with a refrigerated center console. The L remains eligible for available upgraded leather trim pieces, a passenger-side ottoman with knee airbag, and Blu-ray rear-seat video entertainment. Standalone options for all trims, furthermore, include performance tires and LED headlights. Safety-wise, look for the 2015 LS 460 lineup to feature standard 4-wheel antilock brakes, front side-mounted airbags, front and rear head airbags, LED fog lights and running lights, Enform-based Safety Connect emergency telematics, turn-signal-integrated mirrors, and self-leveling high-intensity-discharge (HID) headlights. Of course, a post-collision safety system and a remote antitheft alarm return standard for this model year, while optional safety stuff includes blind spot monitoring, adaptive cruise control, emergency braking assist, and a driver attention monitor. 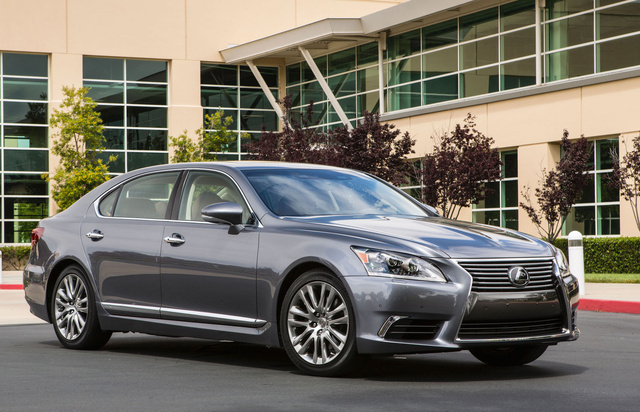 What's your take on the 2015 Lexus LS 460? Users ranked 2015 Lexus LS 460 against other cars which they drove/owned. Each ranking was based on 9 categories. Here is the summary of top rankings. Have you driven a 2015 Lexus LS 460?